Thanks for the chance / fingers crossed!! Cute gift card. Would love a temporary butterfly tattoo! I “liked” Totally Target on facebook! Don’t just like Totally Target, I LOVE IT! Thanks for so many wonderfull opportunities to win! 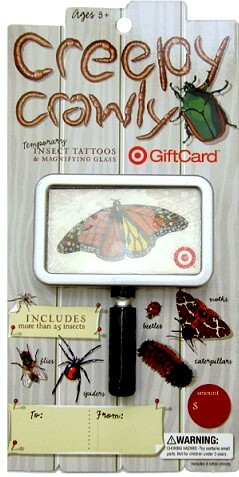 I hate bugs but I love gift cards! Thanks for always keepin us posted on the savings! What a great gift card. You always find the coolest giveaways! Thanks so much for keeping us informed about great deals!! I am feeling lucky. Already like you on facebook! Just liked you on facebook. thanks! Would loooove one of these super cool gift cards!!! I love your gift cards! Thanks for the chance! I love TT! This gift card would be awesome. I already follow Totally Target on FB . Love all your facebook posts! This would be such a great help to me! Thanks for the awesome giveaway! so cool! Thanks for the great giveaways! Saving lots of money using your site and enjoy all the ‘extras’ you provide. I love your page. Thanks for all your help and for a chance at this giveaway. Can always use a Target gift card! cool hope to win! thankyou! I follow up on Facebook. Enjoy your site. I check this site daily for the awesome info!! Thanks! !